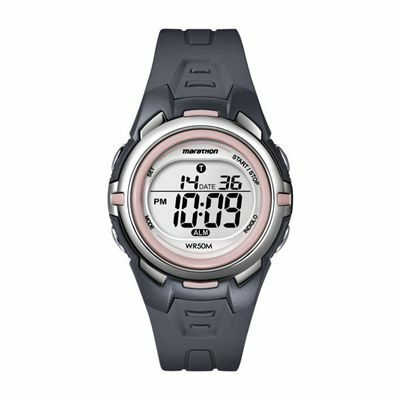 The Timex T5K360 ladies marathon watch is a perfect choice for recreational athletes and runners. It has a lightweight, feminine design with a baby pink bezel and a dark grey rubber strap, which can be adjusted to the user’s wrist size for an optimum fit. The watch is equipped with an easy to read LCD display that shows date and time in a large clear front. The display is placed inside a black rubber case and can be used in the dark due to the INDIGLO night light. This intuitive watch comes with many handy functions such as a 24 hour chronograph, a 24 hour countdown timer, an alarm function and a stopwatch. It is water resistant to 50m. for submitting product review about Timex T5K360 Ladies Marathon Watch.